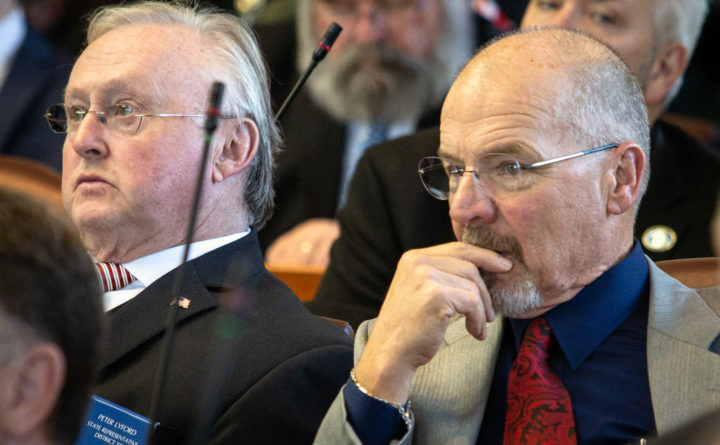 Rep. Peter Lyford, R-Eddington (left) and Rep. Lawrence (Larry) Lockman, R-Amherst sit at their desks at the State House in Augusta. A bill to prohibit teachers from engaging in political, religious or ideological advocacy discussions with students was unanimously rejected by a legislative committee Thursday. LD 589, from Rep. Larry Lockman, R-Bradley, sought to limit the types of classroom discussions teachers can facilitate — in an effort to prevent “political or ideological indoctrination” — according to the language of the bill. A dozen teachers and school administrators decried the bill as an overreach during a public hearing earlier this month. On Thursday, members the Education and Cultural Affairs Committee generally agreed that the issue is best handled at the local level, rather than with legislation. They voted unanimously “ought not to pass,” which effectively dooms the bill. Legislation with unanimous “ought not to pass” recommendations very rarely is resurrected in the House or Senate. The way forward, everyone agreed, “is not with legislation,” Drinkwater said.